This restaurant closed at the end of 2011. When I caught wind of a group of Columbus Undergrounders plotting a trip to Lee Garden for dim sum, well… it didn’t take much arm twisting. Dim sum is an exceptionally unique experience, and a regrettably rare offering in Columbus. For those who are unfamiliar with it, there are (to my mind) two basic ideas to build on – brunch and selection. 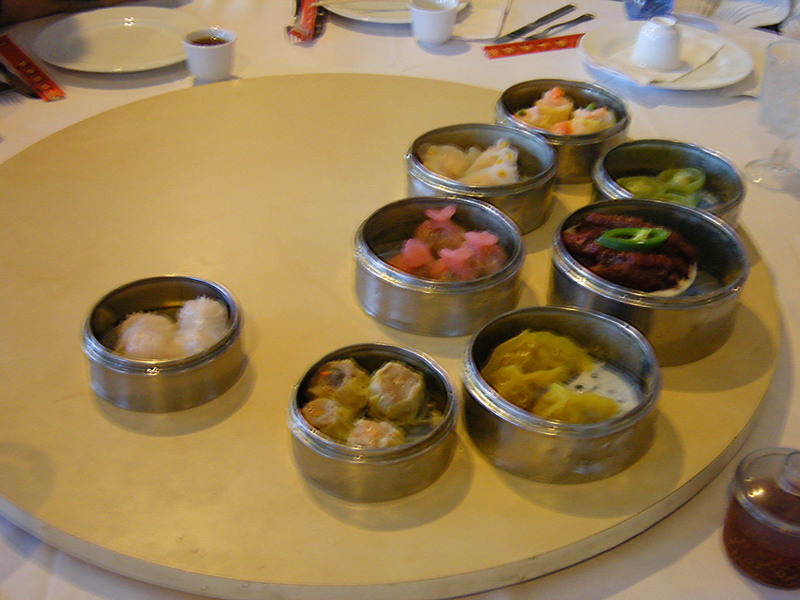 Brunch, in that weekends between 11am and 2pm are the traditional time to take dim sum (some believe that the very concept of brunch in the US was derived from dim sum’s introduction here). Selection, in that the format is small plates (think Chinese tapas) and there are something on the order of 50+ distinct options on offer. I’m tempted to add ‘instant gratification’ to that list – these plates come out on a series of carts that circulate around the dining room. When one comes to your table, the cover is lifted and you may choose as you please. Each cart has around 4-8 options, and carts swing by frequently enough that you’ll rarely be left wanting. 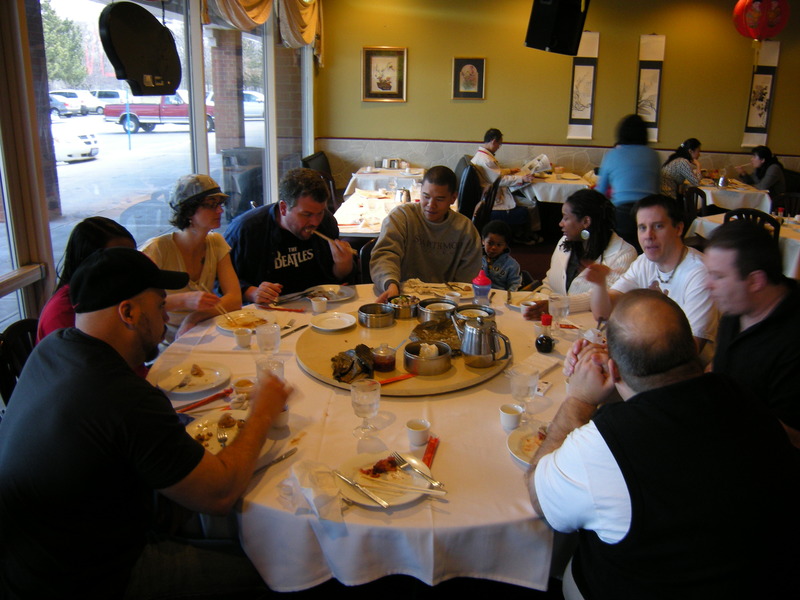 Our group of ten was seated at a large, round table conveniently topped with a lazy susan. With guidance from DavidF (the trip organizer and a veteran dim sum enthusiast), we filled the lazy susan with a wide assortment of small dishes. Pictured above is a portion of our meal, including pork and shrimp shu mai, potstickers, shrimp har gow, and chicken feet. This represents perhaps a third of the total number of dished ordered. Pork shumai – A mix of pork, onions and mushrooms filling what is essentially an open-ended steamed dumpling. That these are delicious is no surprise, as they’ve achieved such a level of popularity that they can even be found in the freezer section at the supermarket. Skip those, and eat these. You’ll be glad you did. BBQ Pork Buns (char siu bao) – These are snow white steamed buns filled with a lurid red BBQ pork. The bun texture is somewhat dense and chewy, and difficult to describe save to say that its entirely unlike anything you’d expect from a wheat based bread (which it is). Get a bite of it with some of the sweet and garlicky BBQ filling, though, and it all makes sense. This was the dish that DavidF craved the most, and it was easy to understand why. Chicken Feet – a hell of a lot of work must’ve gone into turning the raw feet into what made it to my plate – these were the complete opposite of tough and chewy, almost unnervingly so. Each bite, for me, equated to one ‘toe’, and became a mouth exercise in separating gelatinous flesh from bone. The flavor of the black bean sauce was enjoyable, and… I guess I can say I did it. Eventually, the ordering slowed down and the slump of satisfaction set in. We ate a lot… what’s that going to set us back? $9 and change per person. All dishes cost between $2.95 and $3.95. Quite a few of the dishes appear to be vegetarian, though I’d suggest asking about the sauces to make sure. Pescetarians should be fine. I’m glad everyone had a good time. I have yet to meet someone who hasn’t enjoyed dim sum. There is generally something there for everyone. I was especially impressed with the sesame balls filled with red bean paste. Great way to end the meal. There are some places in Columbus that serve Dim Sum where you order from a menu rather than choosing dishes from a cart, for example Little Dragons on Morse road. Lee Garden uses a Dim Sum menu for the weekday lunch Dim Sum, too. 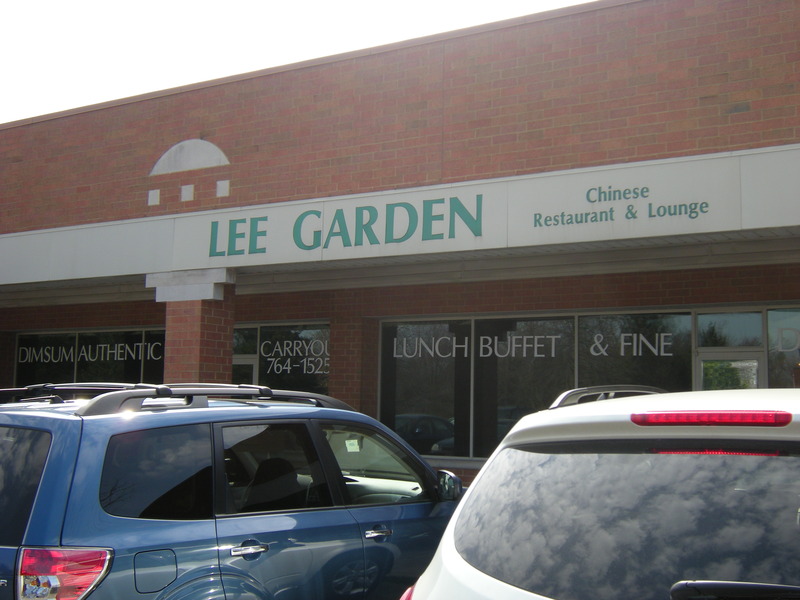 I’m glad to hear that the food was good – Lee Garden used to be a slam dunk, but I’ve heard varying reports about quality over the past 2-3 years with some ownership changes. It sounds like they’ve gotten it back together again, which is great news for Columbus foodies, and bad news for my wallet. It had been a while since I had been to Lee Garden before I went last spring. I had also heard the same mixed reviews so I had some trepidation. Fortunately, I’ve been for dim sum three times since, and it has been excellent each time. And yes, some of my favorite places in town for dim sum, Shangri-La and China First (both sadly out of business), were order off the menu places. The carts add a certain Hong Kongish atmosphere, but it’s really about the food. Sad day indeed. Went by there today and saw that. Just one guy on a lift taking down the outside sign. They may not have been at the same level as Sunflower, but it was still damn good food. If anyone knows how to get in contact with Louie from Lee Garden, please let me know. We want to hire him!! !